So I got myself a Luskwood Bunkies fennec avatar just to stop someone calling me “Digimon”…, as an added benefit now I don’t have to worry too much about exposure anymore. Though it seems that everyone are fairly easy on copyright, so I wonder why I’m worrying in the first place? And the shirt… I watched last week’s video tutorial and decided to turn the shirt design (that was featured in SkyKain’s rendition of my forum avatar) into (virtual) reality. This should look good enough at 16*16 px. Wikipedia is full of amazing things. Aren’t I supposed to be looking for a room? 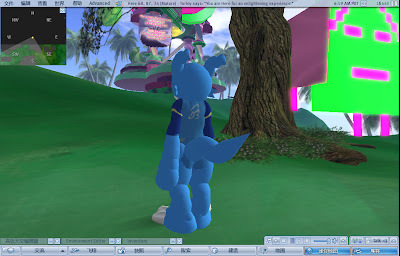 How did I manage to spend almost one whole day on Second Life®? Then in the afternoon I suddenly have the great idea of attending Torley’s office hours. Standing in the 20-metre-high office, thinking arriving one hour early would let me cache the data beforehand… but coming back from the washroom I found myself on ground zero and a rather big sign where the office once stands. Here (no, not here, Here) has a lot of surreal watermelon colored landscape, and equally, if not more surreal facilities. The actual meeting place is still the same from Grasmere, though. Then we saw Squirrel Wood’s awsome land creator. I’m still not sure how you’re supposed to use it though… or how this is an improvement over the built-in one. But it took over two years to create, so it must be awsome, right? … So that concludes Geneko Nemeth’s Second Life for today. What, you’re asking what Kakurady is doing? Nothing. He definitely doesn’t want a family reunion in his subconsciousness. Okay – I updated WordPress to 2.6.0, but I don’t think you’ll be able to see much difference in the front. That’s probably the point, don’t you think? Happiness is a fursuit! (?